The notion that gender is fluid and performed isn’t new. Simone de Beauvoir stated in 1949 that “one is not born, but rather becomes, a woman,” and it has been three decades since Judith Butler expanded on this, writing on the “unnaturalness” of gender. Yet, the boundaries of this unstable form of identification continue to shift and the plurality of its subject positions demand reappraisal, which explains the proliferation and relevance of exhibitions on gender today. 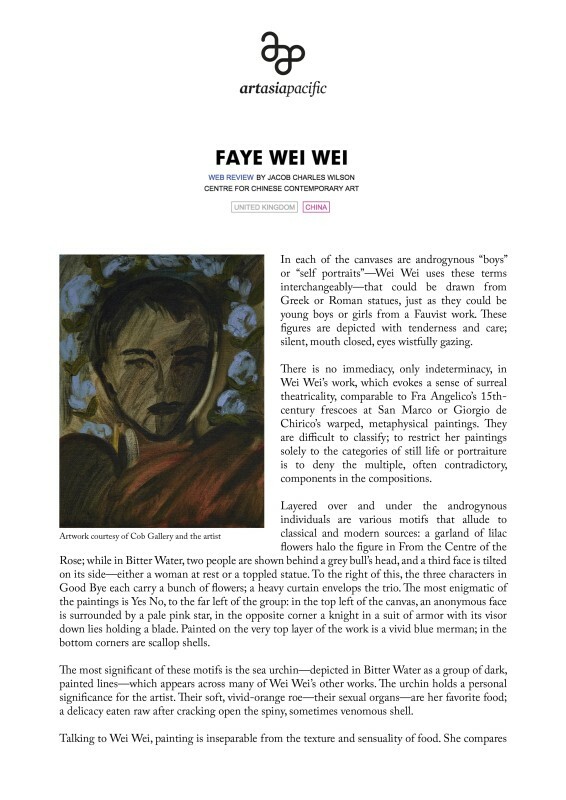 Presented as the latest exhibition of the “Concepts of Gender” series at Manchester’s Centre for Chinese Contemporary Art, Faye Wei Wei’s solo show featured four new oil paintings, made over the course of the past year. Two large canvases, Yes No (2017) and Good Bye (2017), each the height of the artist herself, flanked a medium-sized work, Bitter Water (2017). To the right of this group, on its own wall, was one painting barely larger than a sheet of paper, entitled From the Centre of the Rose (2017).